This edition covers content promoted between 3 and 9 February 2013. Richard Wagner (nom) by Smerus et al. Wagner (1813–1883) was a German composer, theatre director, polemicist and conductor who greatly influenced the development of classical music. Primarily known for his operas, Wagner began writing music in the 1820s with influences from Beethoven. He remained highly productive, but until his final years, Wagner's life was characterised by political exile, turbulent love affairs, poverty and repeated flight from his creditors. Fort Dobbs (North Carolina) (nom) by Cdtew. Fort Dobbs was an 18th-century fort in the Province of North Carolina which was used for frontier defense during and after the French and Indian War. Named after Arthur Dobbs, it was the only fort on the frontier between South Carolina and Virginia during its active years. After being abandoned in 1766 it disappeared; the site was only rediscovered in 2006. Homework (Daft Punk album) (nom) by Hahc21. Homework is the 1997 debut of French electronic music duo Daft Punk. Produced without plans to make an album, it was ultimately released on Virgin Records to commercial success, charting in 14 countries and selling more than 2 million copies. It ignited international interest in French progressive house and touch music. Alloxylon flammeum (nom) by Casliber. Alloxylon flammeum is a medium-sized tree of the family Proteaceae native to tropical rainforests in Queensland, Australia. Formally described in 1991 after being split out from Oreocallis, it is readily available for cultivation. It prefers areas with good drainage. It is nationally considered "vulnerable" as its habitat is the target of clearing. Percy Fender (nom) by Sarastro1. Percy Fender (1892–1985) was an English cricketer who captained Surrey for ten years and played in 13 Test matches. He was noted as a quality cricketer as early as 1914, and in 1920 he set a currently-unbroken record by hitting a first-class century in 35 minutes. Although a popular choice with the press, he never became captain of the England national team. After his cricket career ended in 1935 he continued to write about the subject. The King and I (nom) by Wehwalt and Ssilvers. The King and I is a 1951 musical adapted from Margaret Landon's novel Anna and the King of Siam by Richard Rodgers and Oscar Hammerstein II. The two act drama follows a British schoolteacher who is hired by the King of Siam; their relationship is marked by conflict and an unrecognised love. The play was a hit, running for three years on Broadway and receiving three Tony Awards. It continues to be staged by amateur and professional troupes. List of North Carolina Tar Heels in the NFL Draft (nom) by Disc Wheel. The Tar Heels, an American football team from the University of North Carolina at Chapel Hill, have had 205 players drafted into the National Football League since 1936. The highest selection was second overall. 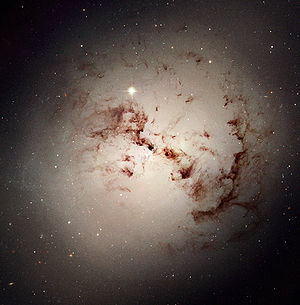 NGC 1316 (nom; related article), created by NASA, ESA, and The Hubble Heritage Team and nominated by LlamaAl. NGC 1316 is a lenticular galaxy about 70 million light-years away which was likely formed by the merger of two or more galaxies. Lötschberg railway line (nom; related article), created by David Gubler and nominated by Elekhh. The Lötschberg railway line is a major railway through the Swiss Alps known for its double-loop spirals and numerous tunnels and viaducts. Map of Lorentz National Park (nom; related article), created by Sémhur, translated and nominated by Elekhh. Lorentz National Park in Papua, Indonesia, is the largest national park in South-East Asia. Much of it remains unexplored and it likely hides numerous species unknown to Western science. Algol AB movie (nom; related article), created by Fabien Baron, edited and nominated by Stigmatella aurantiaca. Algol is an eclipsing binary star in the constellation Perseus. This new image shows Algol B orbiting Algol A. Head louse (nom; related article), created by Gilles San Marti and nominated by Adam Cuerden. The head louse (Pediculus humanus capitis) is a parasitic insect found only on human heads. They spend their lives there, feeding on blood. Papilio polytes mating (nom; related article), by Muhammad Mahdi Karim. Papilio polytes is a species of swallowtail butterfly common in Asia. They are known to mimic unpalatable species to avoid being eaten. Mount John Laurie (nom; related article), created by Cszmurlo and nominated by Tomer T. Mount John Laurie is a mountain in Alberta, Canada. Part of the Canadian Rockies, it is popular with climbers and has over 100 routes to its summit. Beehive (nom; related article), by Muhammad Mahdi Karim. A beehive is an enclosed structure in which some honey bee species live and raise their young. Natural ones, like the hive of Apis dorsata pictured here, are found in the wild, while humans make artificial ones to help raise bees. Scorpion Pass (nom; related article), created by אילן ארד and nominated by Ynhockey. Scorpion Pass is a steep, twisted section of Route 227 in Israel which is known to be extremely dangerous as it is in poor physical condition and near several steep drops. Incredipede (nom; related article), created by Colin Northway and nominated by H. W. Calhoun. Incredipede is a physics-based puzzle video game by Team Northway. Osaka Castle (nom; related article), created by 663highland and nominated by Hahc21. Osaka Castle is a castle in Osaka, Japan, which was constructed beginning in 1583. After being rebuilt several times, it now serves as a popular tourist destination. ULPower UL260i (nom; related article), created by ULPower and nominated by Sven Manguard. The ULPower UL260i is an aircooled aircraft engine produced by ULPower in Belgium. Pinball machine (nom; related article), created by Kevin Tiell and nominated by Sven Manguard. A pinball machine is used to play pinball, an arcade game in which points are scored by a player manipulating one or more steel balls on a play field. This machine has been made transparent to showcase its innards. Common poppy (nom; related article), by Alvesgaspar. Papaver rhoeas is an abundant annual plant native to Europe with a strong odour which is poisonous to animals. In many countries it is a symbol of fallen soldiers. Scorpion Pass, part of Route 227 in Israel. This page was last edited on 1 May 2015, at 21:11 (UTC).